G R (Mac) Lind Logging of Princeton, British Columbia, has a long history with Caterpillar equipment, and their equipment line-up includes two Cat 320D processors, equipped with Waratah 622 heads, which continue to be proven performers (Cover photo by Paul MacDonald). The Ecosystem Management Emulating Natural Disturbance (EMEND) project in Alberta is looking for additional funding to keep its work on evaluating logging practices in the boreal forest—and their impact on forest health—going for the long term. Resolute Forest Products has ramped up production at its Thunder Bay sawmill as part of a larger capital plan for its facilities in northwestern Ontario, a move that will allow the sawmill to capture more higher grade lumber products. New Brunswick logger Ken Thomas has recently made some significant equipment investments, including a new John Deere 703 harvester with a Waratah H480C head, which has been working well in commercial thinnings—and still does a great job in final harvest. Ontario logger Gord Griffiths is looking to retire, but he’s concerned about who in the next generation is willing to take over the reins, given a constantly changing logging playbook from Ontario’s Ministry of Natural Resources. Sawmilling operation Vancouver Urban Timberworks started out modestly, but it has gradually grown, and the company recently installed a new mill, a Wood-Mizer WM1000—the first WM1000 to operate in Canada—at their production facility in Squamish, north of Vancouver. Producing everything from guitars to hockey sticks, Ontario mill operation Sawmill Sid is working hard to see that the trees in Toronto that have been hit by the Emerald Ash Borer have added value, and don’t just end up in tub grinders. 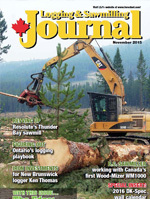 Included in this edition of The Edge, Canada’s leading publication on research in the forest industry, are stories from the Canadian Wood Fibre Centre, Alberta Innovates - Bio Solutions and NRCanada. Jim Stirling on how B.C. forest companies are heading to North America’s lowest cost lumber producing region—the U.S. South. If you were walking in a Canadian forest this past summer, there is a probability you might have got zapped by a laser. That’s because LiDAR (Light Detection and Ranging, also known as Airborne Laser Scanning), as part of Enhanced Forest Inventories (EFI), is taking off across Canada. But not to worry, it’s perfectly safe… nor will you know you just got scanned by LiDAR. A recent informal compilation of usage of the technology across Canada revealed over five million hectares (ha) of forested land where EFI has been created (Table 1). There is also 25+ million ha of forested land base across Canada where Airborne LiDAR has been flown, but a full EFI has not yet been generated. A further 50+ million ha is in the planning or proposed stages for LiDAR acquisition. And it’s not just in Canada where the scanners are flying. An early report8 by the US Forest Service (USFS) provided a favourable comparison of the cost-benefits of a LiDAR based inventory vs. a traditional inventory for annual sampling in a 500,000 ha even-aged managed forest, reporting a time savings of 28 per cent and dollar savings of 45 per cent. A 2011 study9 by the USFS in Oregon on an operational implementation of LiDAR-based EFI concluded it was cost competitive compared to traditional methods for areas of 20,000 ha and greater. Oregon has since gone ahead with a full acquisition at the state level. The government of Montana is evaluating an acquisition for the state, referring to Oregon’s program. The State of Maine has reported10 a benefit to cost ratio of 4:1, with a payback of 2.3 years for all uses within a State sponsored LiDAR acquisition. Forest resource management was ranked as the third highest benefit and that’s just from the better terrain models. An Australian study11 in a 250,000 ha forest showed positive cash flow after two years, and a five year total NPV of AU$1.4 million. “Next question: what technology is being used for inventory in B.C.? Why isn’t the best LiDAR technology available that’s being used in Alberta?” Question from B. Routley to Hon. S. Thompson, Minister, March 5, 2015. The Ministry is not being left behind15. Better, Faster, Cheaper. If a technology has these three characteristics, it is very likely to be rapidly taken up in operational situations. From the get-go, everyone realized that LiDAR-based EFI was better. Now, as the big picture clears on all the uses the data can be put to, it is rapidly being realized as cheaper. Research and experience will only lead to the technology becoming faster. LiDAR and Enhanced Forest Inventories are earning their stripes for all three characteristics—and uptake is increasing across Canada. 4 http://www.cif-ifc.org/wp-content/uploads/2014/05/Platt_BPG_2014.pdf slides 26, 27. 9 J. of Forestry Vol. 109(5): 267-273. With files from Sandra Allen, Dean Toole, and Caroline Gosslin (CWFC), and Matt Kurowski and Colin Koszman (FPInnovations). LiDAR for forestry purposes and Enhanced Forest Inventory. All four Atlantic provinces have partnered in a proposal to capture A-Lidar at 6 hits/m2 over 23,000,000 ha. In Newfoundland, the Corner Brook Pulp and Paper flagship site (119,000 ha of strips in a sampling design) is saving the company money by substituting less expensive balsam fir based upon EFI showing where wood of suitable density is located. The Black Brook pilot study in N.B. (194,000 ha with EFI) has proven very successful with J.D. Irving calling it a ‘Game Changer’. The Province of N.B. has 1,500,000 ha of LiDAR coverage with another 1,700,000 ha for 2015 and plans to get to full coverage of 7,800,000 ha by 2022. Quebec has about 7,700,000 ha of LiDAR (all uses). MFFPQ-Direction des inventaires forestiers has LiDAR coverage for Lac St.-Jean (2012, 1,200,000 ha), Mauricie (2014, 130,000 ha), and a proposal for Outaouais (2015). MFFPQ-DIF has released its costs/benefit study for a provincial level adoption of LiDAR (52,500,000 ha). Tembec’s Hearst (1,250,000 ha) and Romeo-Malette (625,000 ha) flagship sites have operationally used LiDAR and EFI for several years with annual savings of $2.4 million. No known adoptions for forestry. The Province of Alberta acquired LiDAR at 2 hits/m2 for the entire working area (28,000,000 ha). West Fraser Hinton and Sundre flagship sites (989,000 and 535,000 ha) have benefited from EFI for several years. One major licence (1,200,000 ha) has adopted EFI. Several other companies were evaluating their options as of May 2015. The Clearwater area was flown (65,000 ha) in 2006 for A-LiDAR. The Fort Nelson and Fort St. John areas were flown prior to 2010. The Horn River Basin in northeastern B.C. was flown (70,000 ha) for oil and gas but made available for forestry purposes. One division of a company in the Kootenay area and in the Central Interior (430,000 ha) have LiDAR. BCTS along with Western Forest Products partnered on an 114,000 ha area on northern Vancouver Island. BCTS has acquired/is acquiring LiDAR for blocks in the Seaward, Strait of Georgia, and Chinook operating areas. Coastal companies have acquired about 1,000,000 ha of LiDAR with some building an EFI; others have committed to acquiring a full LiDAR. Canada’s Softwood Lumber Agreement with the United States expired in October. This could have a significant impact on western Canadian softwood lumber producers as two-thirds of Canadian lumber production is in the West. According to the Canada West Foundation (CWF), a public policy think tank, Canadian lumber exporters should prepare for life without a Softwood Lumber Agreement (SLA) while learning from their positive experiences developing other markets like China and Japan. Their focus should be on Mexico as a primary target, says the CWF. Representatives from CWF delivered this particularly timely message at this year’s Alberta Forest Products Association (AFPA) convention. Alberta Innovates Bio Solutions (AI Bio) is a major and long term sponsor of the event, given its focus on initiatives to advance the development of the bio-economy in Alberta. The forest industry, along with agriculture, are two areas where AI Bio focuses its efforts to fulfill its mandate. The message of the need for diversification that was delivered by CWF representatives was sweet music to the ears of AI Bio Chief Executive Officer, Steve Price. AI Bio has been promoting both product and market diversification within the province’s forest sector for years, as a hedge against too much dependence on the American softwood lumber market. To put Canada’s dependence on the American market for softwood lumber into perspective, CWF noted in its report entitled, “Branching Out – Preparing for Life Without a Softwood Lumber Agreement,” that 66 per cent of all Canadian softwood lumber was shipped to the United States in 2014. Three-quarters of softwood production is in western Canada. “Every time housing starts to improve in the United States, we run back to that market,” Trevor McLeod, Director of the Centre for Natural Resources Policy at CWF told a rapt audience at the AFPA convention. While the recently expired SLA was popular with some Canadian producers because it brought export stability and predictability, McLeod said there is considerable danger in depending too much on the U.S. market. Nor should Canadian exporters expect the U.S. to rush back to the negotiating table for a new SLA any time soon. “The Americans are not interested in an SLA because they have bigger fish to fry,” McLeod said. “They have decided to update the North American Free Trade Agreement (NAFTA) with the Trans-Pacific Partnership (TPP).” So now instead of freer trade among Canada, the United States and Mexico with NAFTA, the TPP brings 12 countries to the table. “Our ability to move the Americans on issues that are important to us is going to be a lot more difficult,” said McLeod. So how should Canadian softwood lumber producers prepare for life without an SLA? Carlo Dade, CWF Director of the Centre for Trade & Investment Policy, said there are export opportunities built into both NAFTA and the TPP, adding that Canadian softwood lumber exporters have an opportunity to build on the success they’ve had establishing new markets in both Japan and China. “The rise of the middle class worldwide is creating greater demand for consumer products,” he said. “And countries like Chile, Vietnam and Mexico have significantly growing consuming classes.” Canada and Mexico are free trade partners in NAFTA, and both Chile and Vietnam are free trade partners with Canada in the TPP. Dade said that the real prize among these three is Mexico. Yet for some unknown reason, Canadian softwood lumber exporters have not exploited this market, even though it represents an easily accessible and attractive market for softwood lumber. Canada not only has a free trade agreement with Mexico through NAFTA, but excellent direct rail, road and marine access to this market. “There really is no better case for us than Mexico,” he said. Currently, 55 per cent of softwood lumber exports to Mexico are from the United States and 27 percent from Chile. Canada is currently in sixth spot, despite Mexican construction workers having considerable experience building with Canadian softwood lumber. “Canadian softwood lumber exporters are already selling to Mexicans in the United States, as 25 percent of the U.S. construction workforce is Hispanic,” Dade concluded. Canadian investment into research programs over the past 15 years to develop new sources of woody biomass feedstock for use in bioenergy and bioproducts applications is paying off, as work done to establish best practices and systems, research plantation sites, and demonstration pilot projects has brought this technology to the cusp of commercial application. Sidders adds that SAIG’s work has been focused on establishing and managing short rotation woody fibre plantations; optimizing individual components along the supply chain from the plantation to the end user in areas such as harvesting, recovery, conditioning, pre-processing and transportation; and evaluation of the growth and characteristics of the feedstock as it relates to product value, carbon budgets, and its cleansing attributes for land, air and water. System development work has resulted in a national network of research plantation sites situated right across Canada, demonstrating different management practices, feedstock with different rotation ages, and fibre samples grown specifically to meet the needs of niche bioproduct industries. In some instances, the sites demonstrate high yield afforestation of large stem, purpose-grown fibre. Researchers have also developed another plantation design resulting in concentrated woody biomass suited for power production as a possible alternative to coal, consisting of hedge plantations of willow, hybrid poplar and clonal aspen with short rotation of only three to five years. “The intent of these plantations is to grow biomass in very short timeframes, recover them, and grow multiple coppice crops from the individual stumps, which typically have a longevity of up to 22 years,” says Sidders. “So we should be able to harvest up to seven rotations from each root system.” An added value with this system is that it could potentially be used to ameliorate and rehabilitate forest sites disturbed for other land uses. A third plantation design that researchers have developed is the mixed wood afforestation model, consisting of fast-growing hybrid poplar or aspen growing as a cover crop, along with softwoods such as white spruce, white pine, or other tolerant softwood species that have localized and regional potential. In addition to offering multiple commercial crops, establishing these types of plantations has the potential to help jurisdictions adapt to a changing climate. “This gives us a good bang for our buck in terms of protecting softwood stems from increasingly extreme climate risk while rehabilitating sites by re-establishing woody root systems and capturing leaf fall from the fast growing hybrids,” says Sidders. 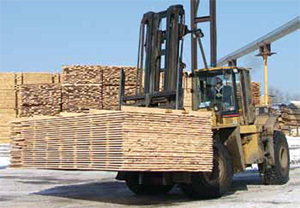 The hardwoods could be carefully harvested after 12 to 16 years. After removal, the established softwoods would then release to become a second crop. “From a changing climate standpoint, trees grown in this plantation model also sequester carbon, carry carbon, and create a new value on that site, with the potential for fibre use in both conventional forest products as well as developing bioproducts,” says Sidders. This model has the added advantage of potential use to rehabilitate sites or to increase the productivity of existing sites using a mixed configuration of native species assisted by a short rotation woody crop. Sidders says there are a number of initiatives underway from coast to coast evaluating short rotation woody biomass as an alternative to fossil fuels in energy production, making better use of marginal to moderate quality land, and as a diversification strategy among farmers where a portion of their land is dedicated to both agricultural production and to afforestation. “We are on the cusp of commercializing these systems mostly with the push for biofuels and green energy being a great option for reducing greenhouse gases,” Sidders says. For more information about the vast catalogue of practical approaches to establishing, maintaining and capitalizing on short rotation woody fibre crops in Canada for commercial use in either bioenergy or bioproduct development, contact Derek Sidders at (780) 435-7355.